Gill Lok Director, Shoe store, Midland, WA. A Single Promotion Makes $28,937! Brad Podmore Owner, Coffee Wholesaler, Malaga, WA. Wholesaler Generates 65 Leads In A Commercial Area From A Simple Letter! “I wanted to promote our coffee wholesale business to the Malaga commercial area. Mark Fregnan & Mario Zorovic of Kinetic Media & Marketing came up with a concept and designed a simple letter which was delivered to Malaga businesses using the UnAddressed Mailing Service (UDS) by Australia Post.” “From that simple mailing, we received 65 responses which I was very happy about. This gives us the opportunity to sell coffee machines, accessories, coffee and tea supplies initially to these businesses as well benefiting from the lifetime sales each client brings to our company.” See video above. Chris Hearn Director, Fabulous Fabrics, Balcatta, WA. Fabrics Retail Store Gets 126 Paying Customers In One Day! Ben Collins & Ross Wyatt (photo with Ross and Mark Fregnan) Directors, security company Osborne Park, WA. $602,153 Increase in Security Products Sales! Jatin Cholera Director, Nexia Corp (formerly Kevin Williams Accounting) Malaga, WA. 52 Enquiries From A Small Newspaper Advertisement! Derek Scott (middle) Owner and Manager Sign business, Malaga, WA. $71,126 Increase in Net Profit in 12 Months! Stanley Kawalksy Director, Kawalsky Lawyers Perth, WA. Ailyn Chen Owner, Ailyn’s Skin and Beauty Subiaco, WA. 66 New Clients & Banked $6,534 In 14 Days! “Using the initial promotion developed by Mark Fregnan of Kinetic Media & Marketing, we received over 70 phone calls and sold 66 bookings over the phone for $99 each. “We banked $6,540 and added 66 new clients to our Subiaco salon. The style of marketing shown to us has been so effective that we are looking at opening more salons in Perth. Julie Armstrong Owner, Elegance Plus (clothing store) Morley, WA. Fashion Retailer Sees The Value In Email Marketing – $4,143 In Sales From One Email Promotion! Shane Moxey Owner, New World Health & Fitness, Gym, Warwick, WA. Gym Owner Ramps Up Marketing Systems! Karin Folau Owner, Karin’s Hair & Beauty Salon Morley, WA. New Customers Within 90 Minutes! Kim Barralet Manager, Shoe store, Midland, WA. Marnie Kallmeyer Owner, Beauty Image Salon, Wembley, WA. Gavin Forrest Manager and Director, Hotmix Group, East Perth, WA. Won the Karratha Computer System Job! Dr Nizar Saab Manager and Director, Longevity Chiropractic, Leederville, WA. Elana Geldenhuys Director, Geldens Pty Ltd, Leederville WA. Steven Donald Manager and Director, Digital Ventures, Myaree, WA. Web Design Firm Sees Results Within the Management Team! Kiera Pedley Manager, Promotional Business, Malaga, WA. Promotional Products Business Improves Customer Management! Glen Smyth’s CDs & DVD’s – Completely inspirational. Categorising our customers – we don’t waste time stepping over dollars to pick up pennies. Thank You notes – Customers always comment! Aldo Del Popolo Automotive Workshop, Balcatta, WA. $7,890 From One Sale and Free Magazine Advertising For 12 Months! Scott Chapman Former Manager Printing business, Joondalup, WA. $6,126 in Sales From a $25 Mailing Campaign! Brad Pecotich Owner and Manager Auto Service Workshop, Balcatta, WA. Rob Lush Owner, Machining Shop, Bentley, WA. Bethne Crisafulli Owner, Care Agency, Innaloo, WA. Implemented Web Automation To Save Hours On The Telephone And To Increase Bookings! Greg & Kiera Owner and Manager, Promotional Business, Malaga, WA. Peter Temple Owner and Manager Printing business, Joondalup, WA. 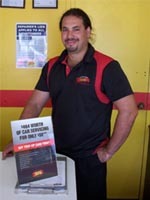 Peter Godwich Owner and Manager Auto Service Workshop, Joondalup, WA. Turnover Up By 13% In 60 Days! Tus Halzi Owner and Manager Auto Service Workshop, Osborne Park, WA. Milton Lay Owner and Manager, Automotive Workshop, Wangara, WA. 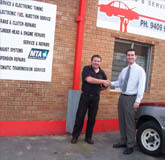 Automotive Service Business Owner Recognised Superior Service! Bob Willers Account Manager, Commercial Insurance, Balcatta, WA. Insurance Broker Implements a Client Feedback System! Mick Woodbridge Owner and Manager, Automotive Workshop, Balcatta, WA. Business Owner Admits To Working Too Hard!